The church is named after the slaughter (Macello) of the martyrs (Martyrum), which supposedly took place in the pagan temples in this area. 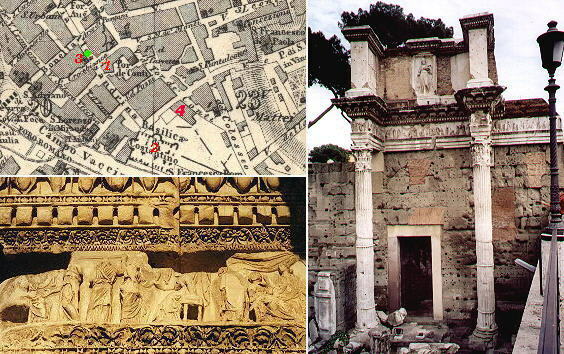 But the church is the pretext to show the ruins of the Temple of Pallas and the Temple of Peace In the description below the plate Vasi made reference to: 1) Tempio Antico di Pallade; 2) Ruins of Tempio della Pace; 3) S. Maria in Macello Martyrum. 2) is shown in another page. 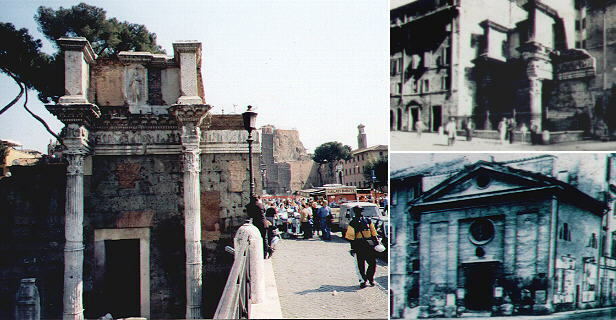 In the 1930s the whole area was excavated and then partially covered to build a large "imperial" avenue between Piazza Venezia and the Coliseum and the unassuming little church was pulled down. The Temple of Pallas was referred to as "le colonnacce" (the ruined columns). Actually the columns do not belong to the temple itself, but to the surrounding porch. You can see in an 1883 tourist map the area before the excavations (the green dot shows the point from which the view was taken). The reliefs show women involved in activities such as weaving which were protected by the goddess. 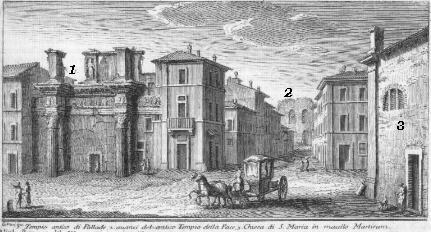 Palazzo Rivaldi (No 4 in the map) had a large garden reaching Tempio della Pace and from its high position had a commanding view over the Colosseo and the Fora. The large building was initially designed by Antonio da Sangallo in the first half of the XVIth century and then modified when it was acquired in 1567 by cardinal Alessandro de' Medici (pope Leo XI). In 1662 it was bought by a charity and turned into a hospice. In 1934 it lost most of the garden and later on it was abandoned because of a possible collapse. In the section of Via dei Fori Imperiali which has replaced the garden of Palazzo Rivaldi there is a modern fountain: its ancient upper basin was found in 1696 near Ostia and was used to embellish the courtyard of Palazzo di Montecitorio. Chiesa di s. Maria degli Angioli Si disse anticamente questa chiesa in macello martyrum, perchè ivi appresso il tempio di Tellure, in tempo delle persecuzioni de' Cristini, se ne faceva macello; ed è tradizione, che nel pozzo, che si conserva nella medesima chiesa, vi siano stati posti molti corpi di santi Martiri. 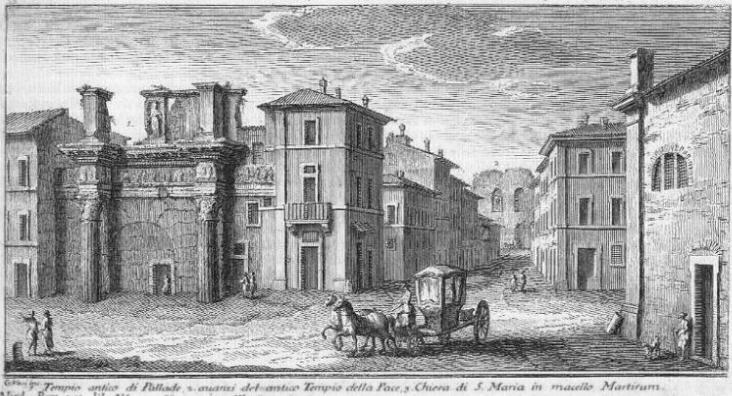 Dipoi essendo questa chiesa nel 1517. conceduta alla confraternita de' Tessitori, vi posero il titolo di s. Agata. Quasi incontro a questa si vede un nobilissimo avanzo creduto del tempio di Pallade, ornato mirabilmente: ma per disavventura molto rovinato, e sepolto quasi per metà. Go to or to Book 3 or to the Plan of my site or to my Home Page on Baroque Rome or to my Home Page on Rome in the footsteps of an XVIIIth century traveller.